for all ages for Summer 2017. We will be adding more pictures over the coming days. We wanted to get our new schedule out to you as soon as it was finished! 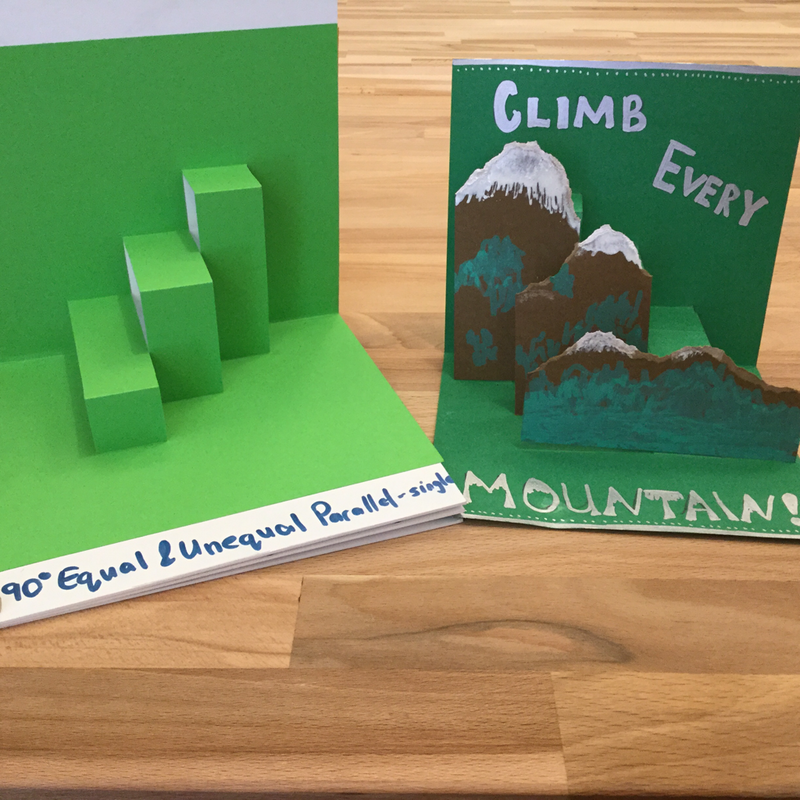 Come learn to create a variety of pop-up structures that can be used to make fun pop-up cards or pop-up books. We’ll learn 6 different 90° and 180° structures that you will combine into your very own sampler book to take home and experiment with. All necessary tools and materials will be provided for your use in the workshop. Appropriate for beginners or those with some experience with pop-up structures. Saturday, July 22 – 10 a.m. to 1 p.m. Learn to make your own blank, soft cover book with this interesting bookbinding stitch that creates pages that lie completely flat, handy for journaling, sketchbooks, or photo albums, and creates a unique, decorative spine. All bookbinding tools and materials will be provided for your use in the workshop, and you’ll go home with a completed blank book. Appropriate for all levels. Saturday, August 5 – 1 p.m. to 4 p.m. Learn to make your own blank, soft cover book with this unique stitch. Stab binding allows you to create a book with a stack of single sheets, which could be useful for binding things like artwork, printed items, or scraps of special paper—useful for keeping special mementos. We’ll discuss several traditional Japanese stitch patterns that you can try out. All bookbinding tools and materials will be provided for your use in the workshop, and you’ll go home with two to four completed blank books. Appropriate for all levels. 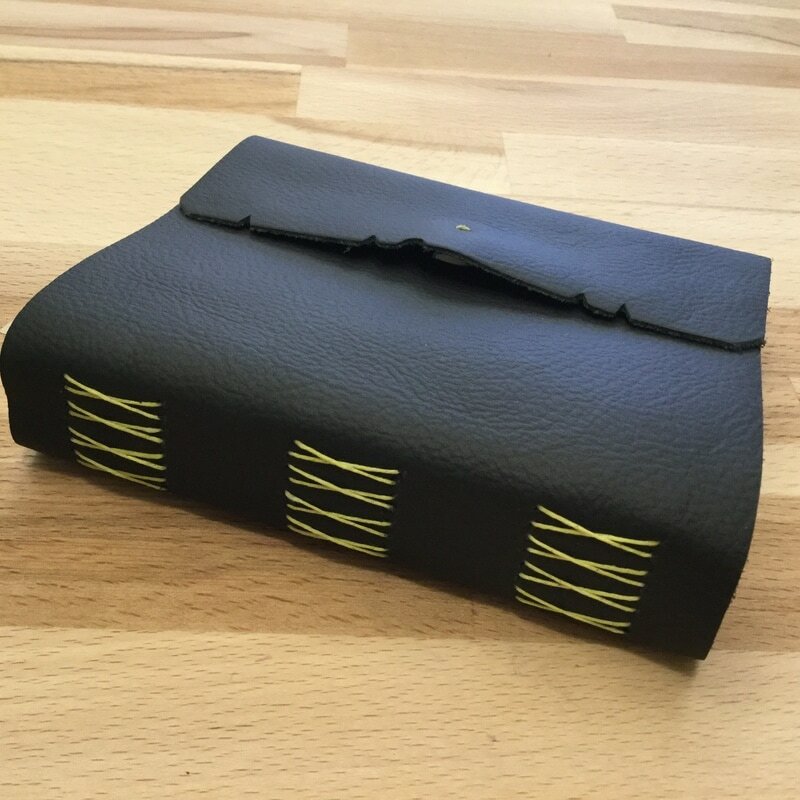 Saturday, August 26 – 1:30 p.m. to 4 p.m.
Look for more bookbinding workshops to return in Fall 2017! 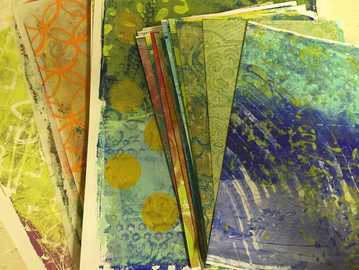 Also, check out the Surface Design & Paper Arts section for more topics of interest to bookbinders. This is your chance to learn how to weave and a get a basic introduction to the many different freestyle weaving techniques that you’ve seen on the samplers in the studio. 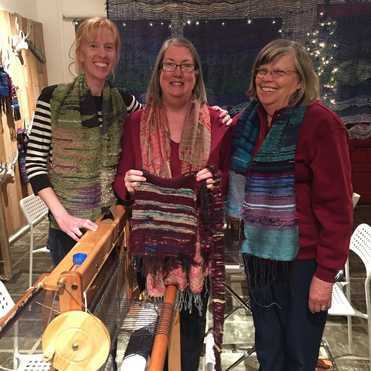 Learn the basics of weaving, gain confidence at the loom, and practice the techniques that will allow you to express yourself at the loom—to weave your heart! Take home a finished sampler of techniques at the end of the third night of the workshop. Appropriate for all levels (intermediate and advanced weavers will be encouraged to explore techniques outside their current skillset). All equipment and materials will be provided for your use in the workshop. ***THIS IS A 3-SESSION COURSE. 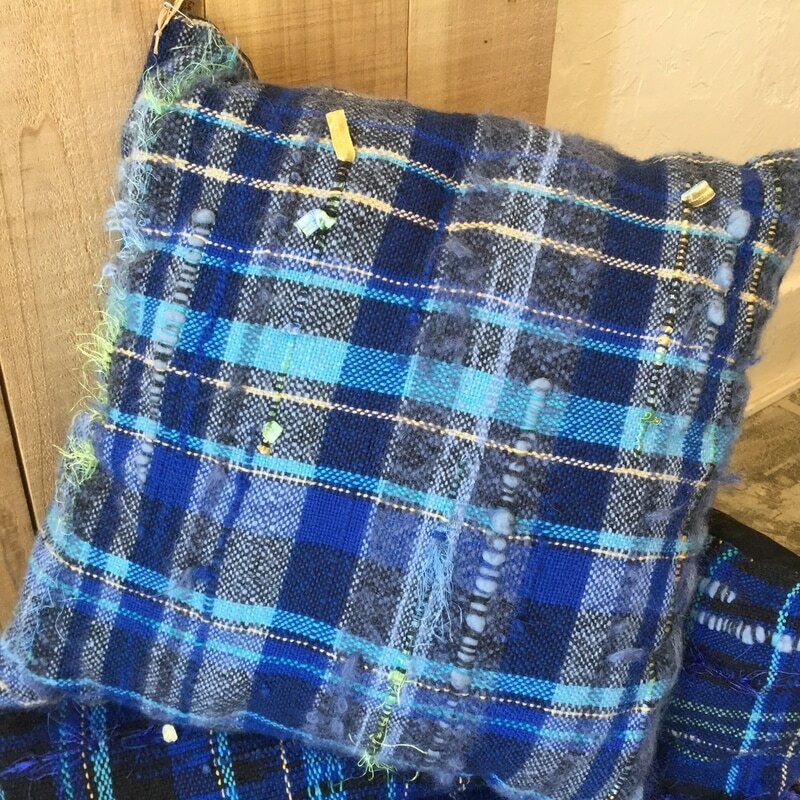 Wednesdays, May 10, 17, & 24 – 6:00 p.m. to 8:00 p.m.
What better to grace your couch than a pillow you wove yourself?! During the first session, you’ll weave a wild and beautiful piece of cloth, and you’ll be encouraged to try new techniques in the process. After washing and drying it at home, you’ll bring it back for the second session to sew it into a beautiful throw pillow. Take home a finished pillow complete with pillow form. Appropriate for all levels of weavers. All equipment and materials will be provided for your use in the workshop, but if you have any special yarn or other inclusions to add, be sure to bring them to the first session. Express yourself through your weaving, then carry it around with you! 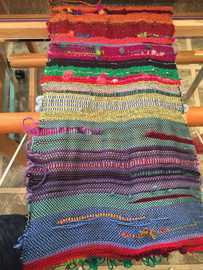 During the first session of this workshop, you’ll weave the fabric for your handbag, and you’ll be encouraged to express yourself through your selection of yarn and techniques. In the second session, you’ll add a lining, leather sides, and wooden handles as you sew your bag together, largely by hand. Appropriate for all levels of weavers, from brand new to advanced. 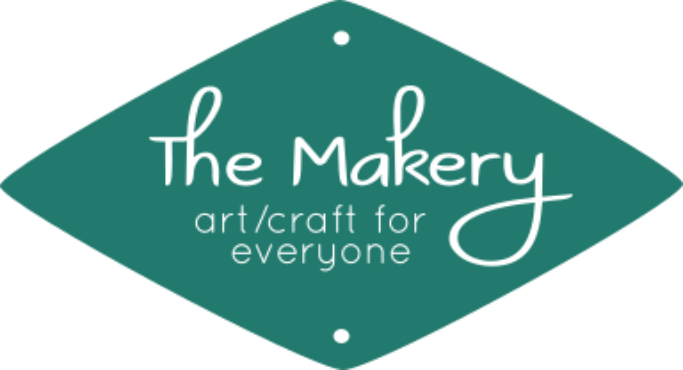 All equipment and materials will be provided for your use in the workshop, but if you have any special yarn or other inclusions to add, be sure to bring them to the first session. 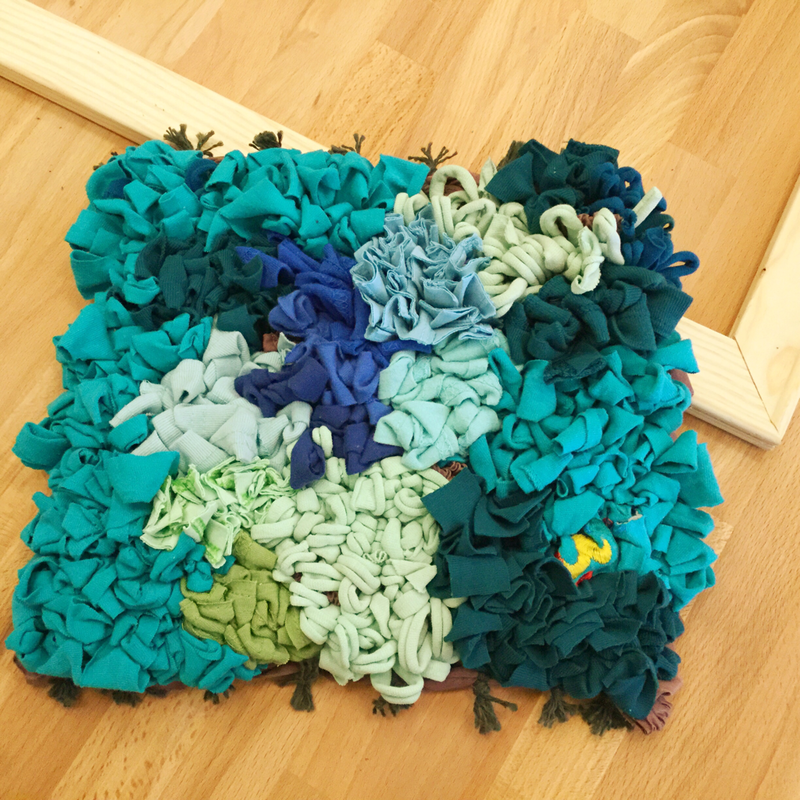 Exercise your creativity with this fun introduction to freestyle weaving. By the end of the afternoon, you will have woven and assembled your funky little hat to keep for yourself or to give away. You’ll be encouraged to think outside the box about the materials and techniques you use in your weaving, perfect for brand new weavers and experienced alike. 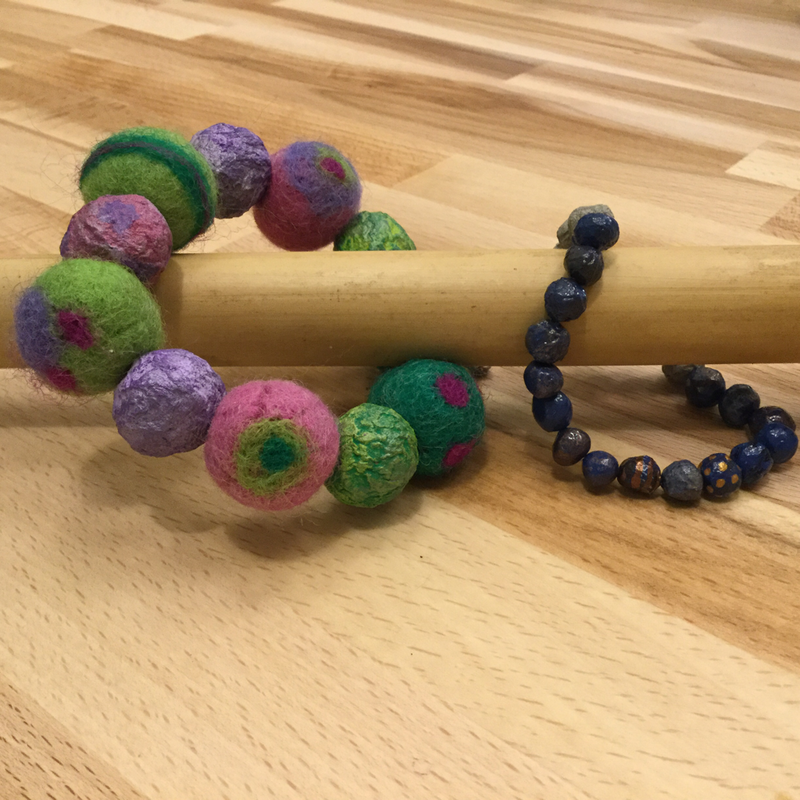 All equipment and materials will be provided for your use during the workshop, but if you have any special yarn or other inclusions to add, be sure to bring them to the first session. Friday, August 25 – 1 p.m. to 4 p.m.
Weaving is fun, relaxing, and satisfying—we think everybody should do it! 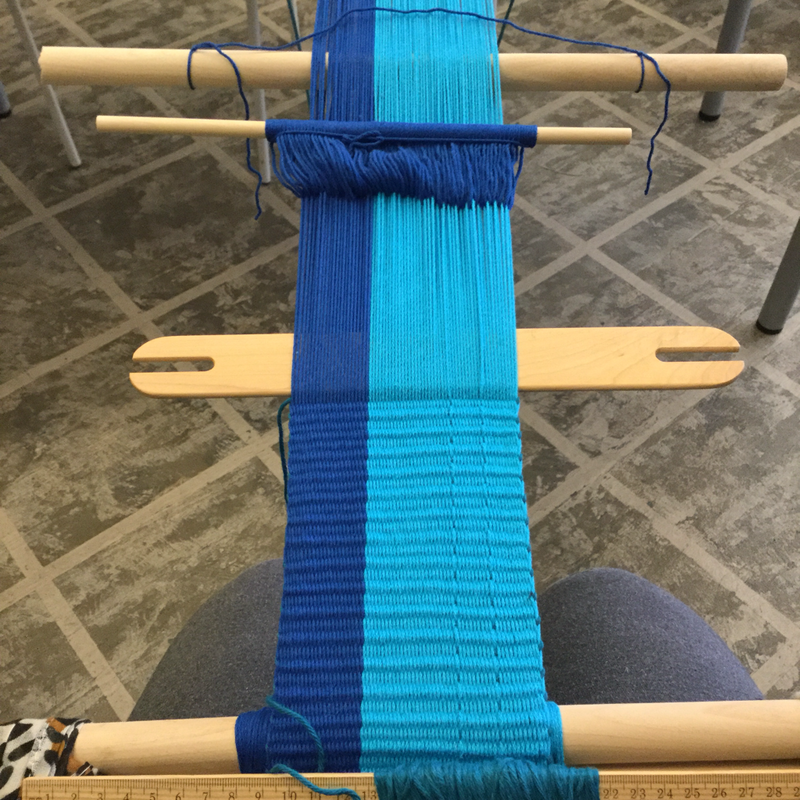 During this summer series on simple looms, we’ll explore various ways to make fabric using affordable and accessible looms that you can create and use on your own. Take one workshop or take many! Warp-weighted looms have been used around the world for millennia. You’ll work on ours, weaving a fabric-strip wall hanging to take home, but you will leave with the knowledge of how to create and use your own. All equipment and materials will be provided for your use in the workshop, but if you have any old fabric or linens lying around that you’d like to use (at least 15” wide), feel free to bring those to use in your weaving. If the weather’s nice, we’ll work outside on the shaded back patio. Appropriate for all levels. 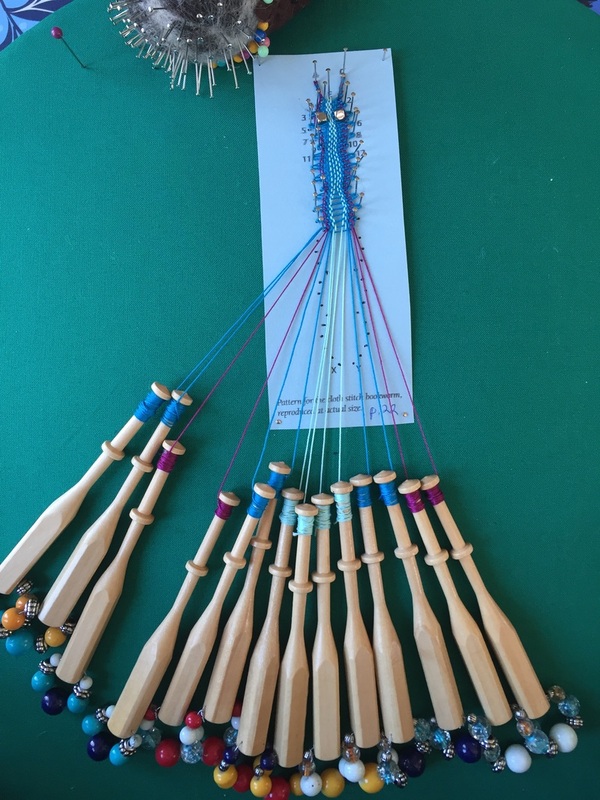 Saturday, June 10 – 1 p.m. to 4 p.m.
Backstrap looms are simple in construction, but can be used to create an immense variety of complex patterns. In this type of weaving, still used in various forms around the world today, the weaver’s own body becomes part of the loom, with a strap around the back that lets the weaver hold one end of the warp and control the warp tension. During this workshop, you will warp and weave your own backstrap, and go home with your very own complete backstrap loom. If the weather is nice, we’ll work on the shaded back patio. The best way to do this kind of weaving is by sitting on the ground, so you may want to bring a pillow or cushion to sit on; however, we can easily make accommodations for those who do not wish to sit on the ground. All equipment and materials will be provided for your use in the workshop. Appropriate for all levels. 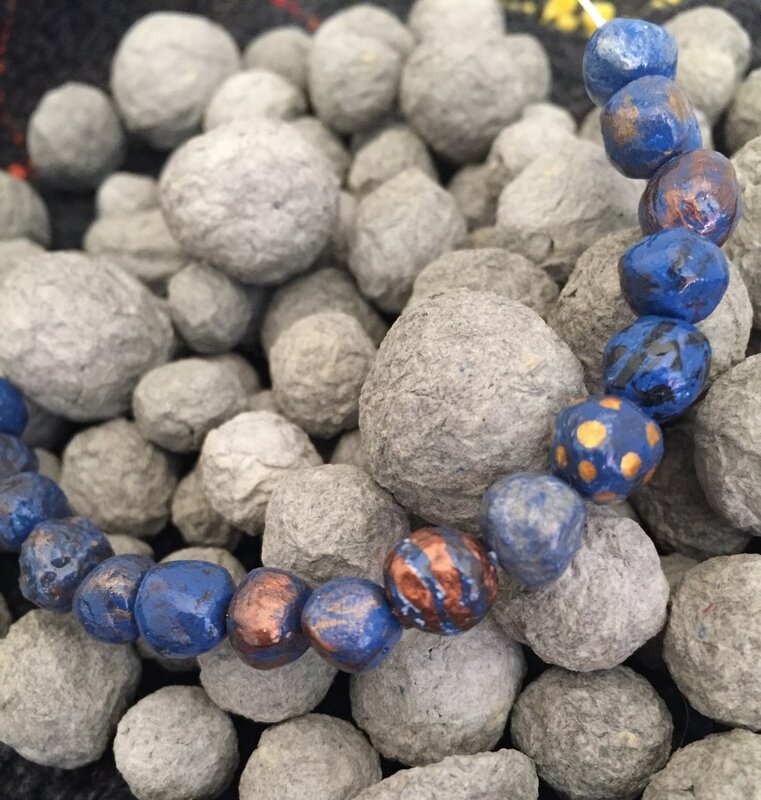 Saturday, June 17 – 12 p.m. to 4 p.m. 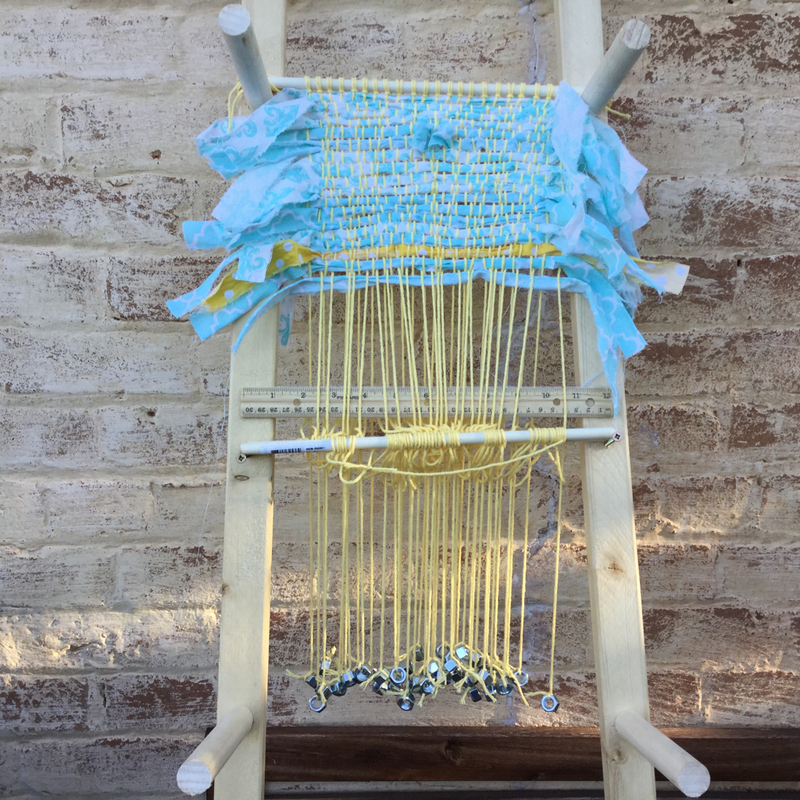 Learn how to make your own frame loom for almost any size you want! We’ll talk about the (very easy!) construction of the frame loom, create our very own t-shirt yarn, weave a small rag mat, then use a special technique to create a boucherouite mat to take home with you. We’ll provide the equipment and materials you need for your use in the workshop, but if you have any old fabric and/or t-shirts laying around, feel free to bring those to use in your weaving. Appropriate for all levels. Friday, June 23 – 12 p.m. to 4 p.m.
A cardboard loom is perhaps the most accessible and affordable loom there is—but you can do so much with it! 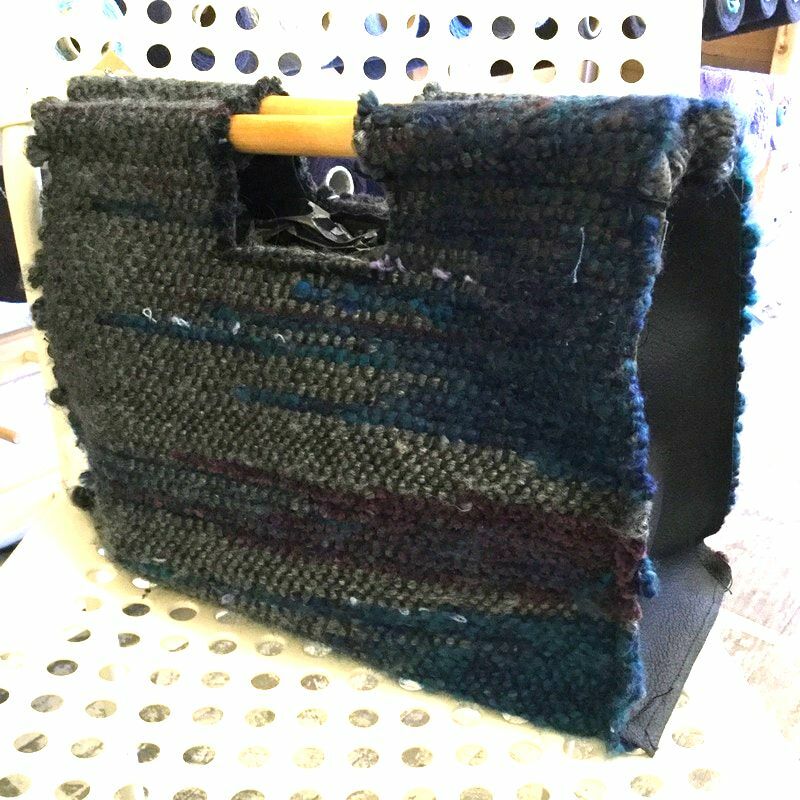 In this workshop, we’ll explore circular weaving on a cardboard loom and the use of Rya knots to make a shoulder bag, which you’ll take home with you. 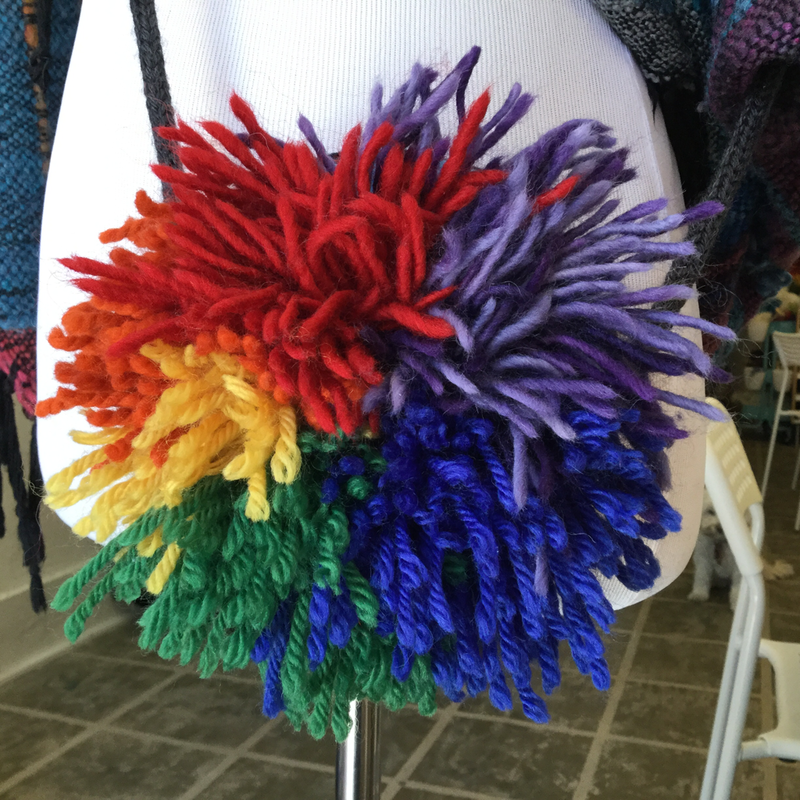 All tools and materials will be provided for you, but if you have any yarn to add to make your bag super-colorful, feel free to bring it (natural materials preferred). Appropriate for all levels. **Please note the change from cushioned stool to shoulder bag, and the accompanying change in time and price. 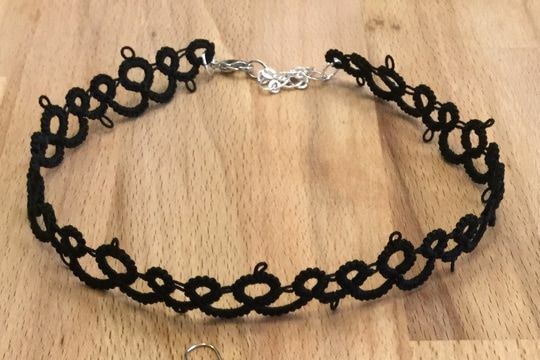 Thursday, June 29 – 5:30 p.m. to 9 p.m.
Needle tatting is an easy way to make traditional lace, but we’ll use it to make distinctive lacy jewelry. We’ll learn the basic stitches needed to make lovely dangling earrings (a perfect Mother’s Day gift!). All tools and materials will be provided for your use during the workshop. Appropriate for all levels, even beginners! 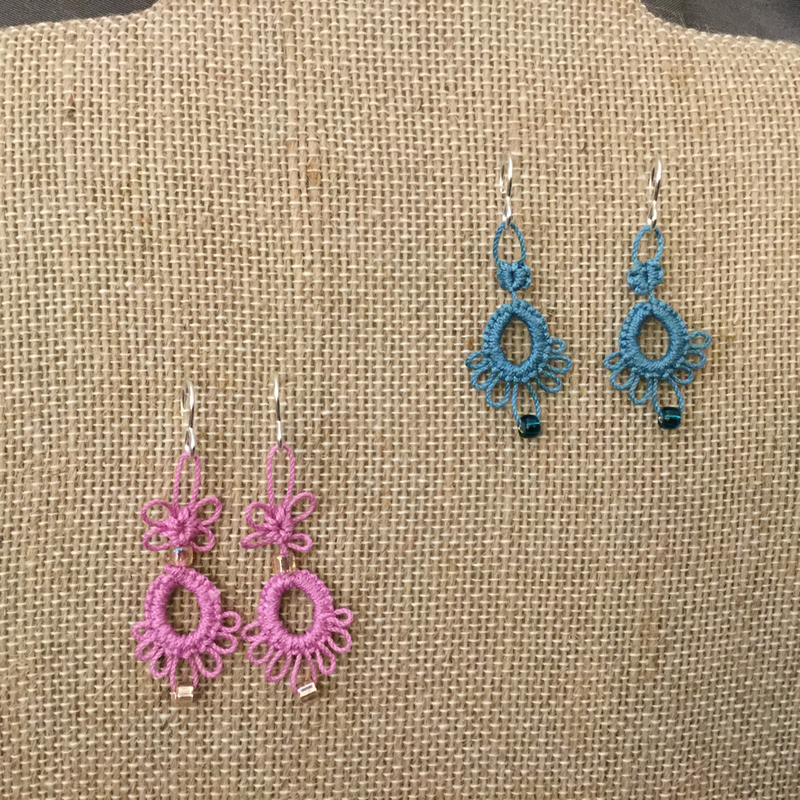 Saturday, May 13 – 1 p.m. to 4 p.m.
Needle tatting is an easy way to make traditional lace, but we’ll use it to make beautiful lacy jewelry. You’ll learn the basic stitches needed to make a unique anklet or bracelet; we’ll also learn a slightly more advanced split ring technique. All tools and materials will be provided for your use during the workshop. Appropriate for all levels, even beginners! Friday, June 2 – 1 p.m. to 4 p.m.
Have you ever thrown a wool sweater in the washer/dryer and come out with a shrunken mess? Don’t throw it out—use it to create something awesome! What you’ve done is called “fulling” (commonly thought of as felting), and we can do this on purpose to get some lovely, sturdy fabric, which we can easily cut apart and sew up to make useful and beautiful items. 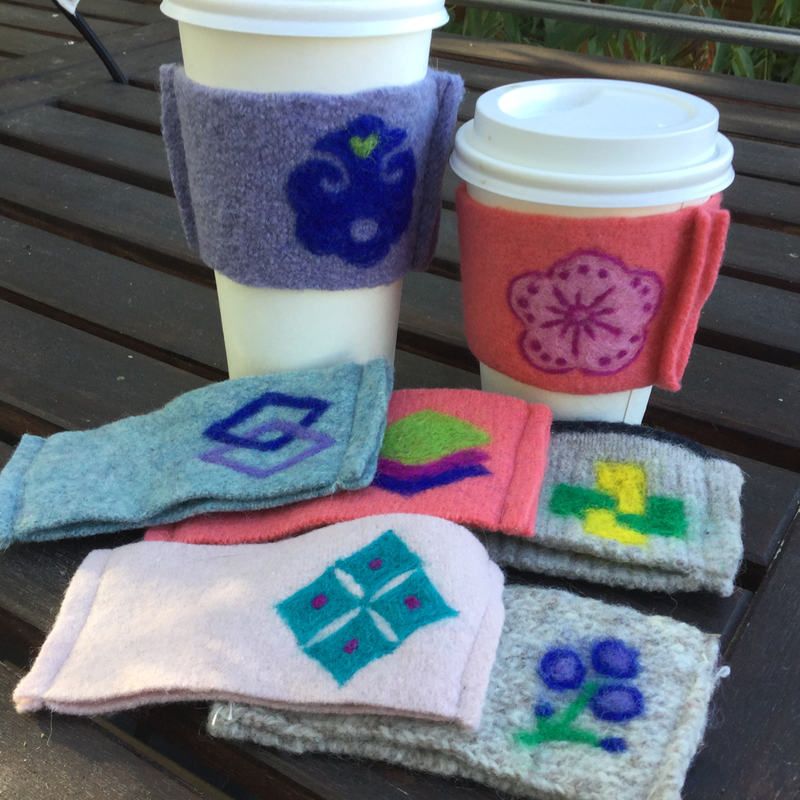 In this workshop, we’ll discuss how to full products made of protein (animal) fibers, then we’ll cut some pre-fulled items up to make delightful little cup cozies for your take-out hot beverage cups (a stylish and eco-friendly replacement for the cardboard sleeves you normally get). Then you’ll learn how to needle-felt a design onto your freshly minted cozy. All tools and materials will be provided for your use during the workshop. Appropriate for all levels. 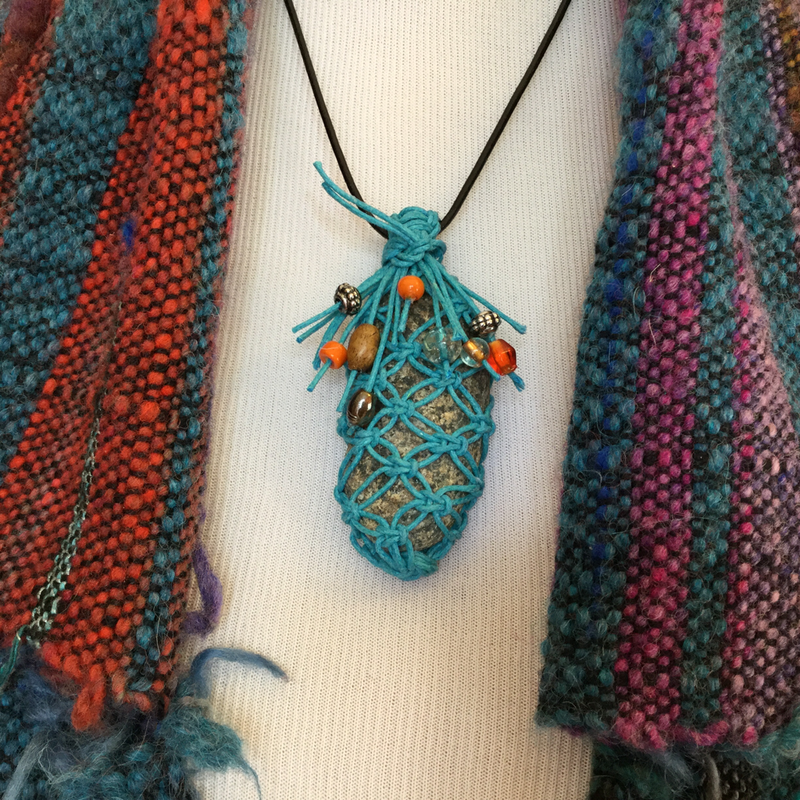 Friday, June 9 – 2 p.m. to 4 p.m.
**Please note the change from Macramé Market Bag workshop. Saturday, July 1 – 1:30 p.m. to 4:30 p.m. Learn how to make your very own yarn from scratch! In our experience, spinning yarn is the closest thing to magic that you can get, and is a very relaxing and meditative activity (once you get the hang of it!). 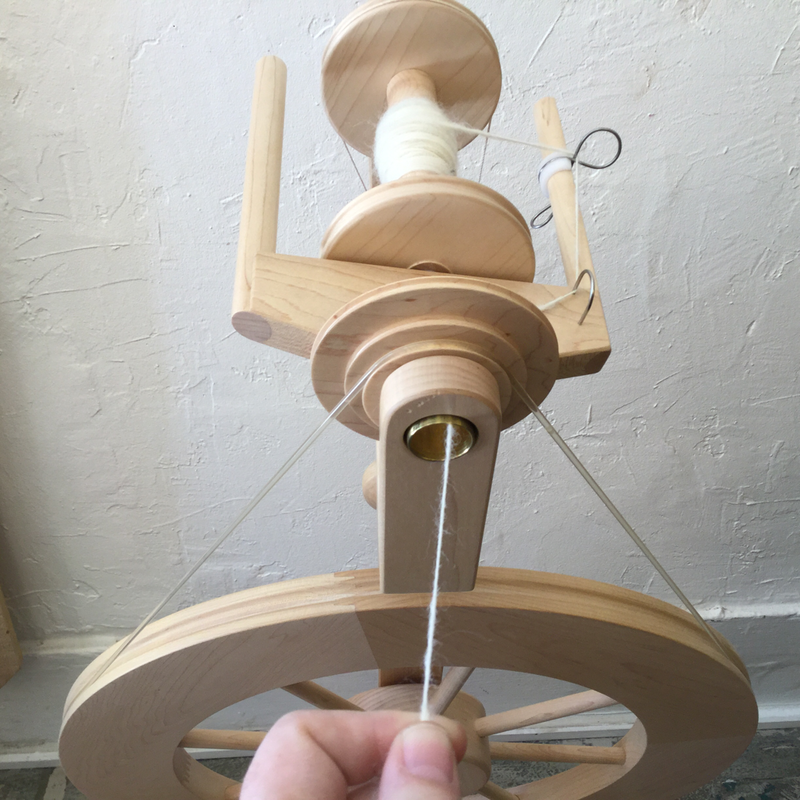 We’ll get familiar with some different kinds of spinning wheels, then learn and practice the basics of spinning a singles yarn. If there’s time after a bit of practice, we’ll talk about some ways you can ply your finished yarn. 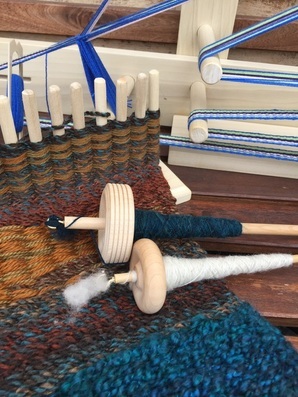 All equipment, including a spinning wheel, and materials will be provided for your use during the workshop, and you’ll go home with a small skein of your very own handspun yarn. If you have your own spinning wheel, we encourage you to bring that to the workshop (if possible). Appropriate for brand new to beginning spinners. 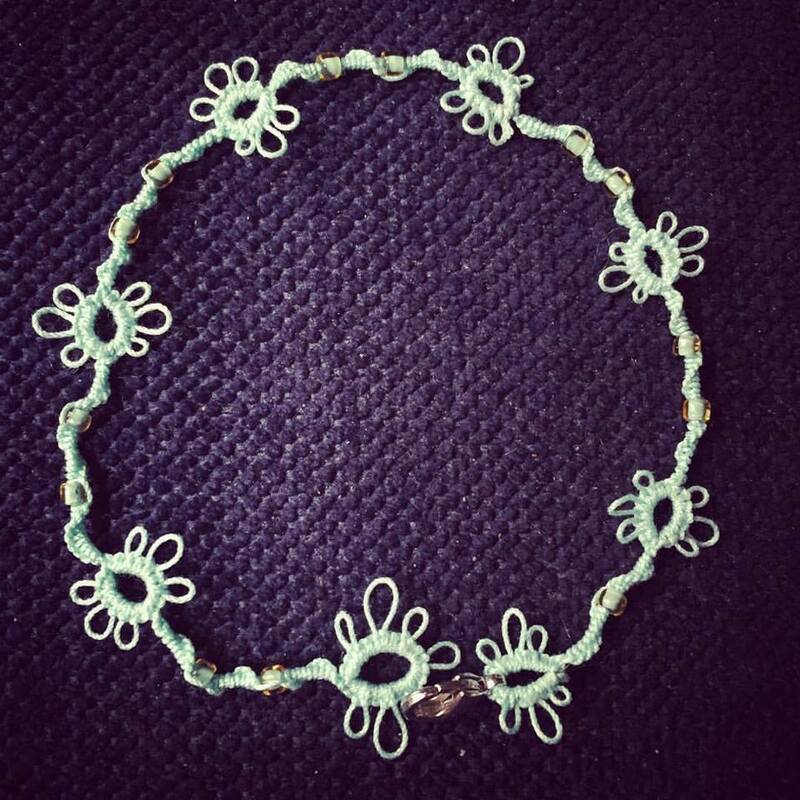 Saturday, July 29 – 10 a.m. to 1 p.m.
Needle tatting is an easy way to make traditional lace, but we’ll use it to make beautiful lacy jewelry. You’ll learn the basic stitches needed to make an elegant choker. All tools and materials will be provided for your use during the workshop. Appropriate for all levels, even beginners! Friday, August 4 – 1 p.m. to 5 p.m.
Freeform crochet is ideal for you if you (like me) hate following patterns and just want to play with yarn and with different stitch patterns, putting them all together into one harmonious and joyous piece of crocheted fabric. We’ll explore how to put different techniques together within one piece, then learn how to join several pieces together in a freeform way. This workshop does require a basic knowledge of how to crochet—you should know how to make a foundation chain, single crochet, half double crochet, double crochet, slip stitch, join yarn, increase, decrease, and fasten off; as such, this workshop is appropriate for advanced beginner to intermediate levels and above. Please bring your own crochet hooks. A limited amount of yarn will be provided for you, but in freeform crochet, we want to have a good variety of yarn to choose from, so please bring your own yarn, as well. You will go home with a small-to-medium-sized piece that could be fashioned into a bag of some size (depending on how much time you are able to spend on it in the week between sessions). Saturdays, August 26 & September 9 – 10 a.m. to 1 p.m.
**Please note change in dates and times. Easy to learn and almost mesmerizing, suminagashi—Japanese for “floating ink”—is an excellent introduction to the art of marbling using just water and ink. It’s used to decorate things like book covers, cards, photo mats, or just as art for your wall, as well as fabric. 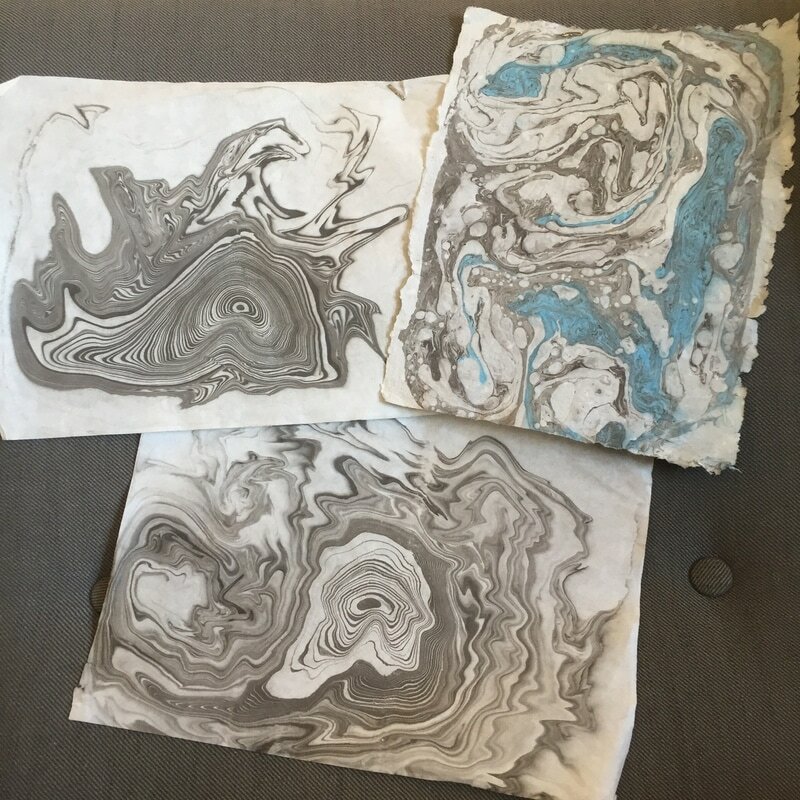 All tools and materials will be provided for your use in the workshop, and you will take home several sheets of marbled paper. Be sure to wear clothing you don’t mind getting a little wet and/or dirty. If it’s not too windy (which will affect our marbled prints), we’ll work outside on our shaded back patio, so be sure to dress appropriately. Appropriate for all levels. Saturday, May 20 – 1 p.m. to 3 p.m.
Come learn how to use old office paper you would normally just recycle to make beautiful new paper. We’ll go through the whole process from start to finish, and you will leave with several sheets of paper. All equipment and materials will be provided for your use during the workshop; if you have any office paper (NOT newspaper) to recycle, please bring it with you—especially colored sheets of paper! Making paper is a wet, outdoor activity, so please come prepared to work on our shaded back patio. Appropriate for all levels. Saturday, June 3 – 1 p.m. to 4 p.m. Learn how to make beautiful bowls out of little more than recycled newspapers and some paint. During the first session, we’ll make the pulp and craft it into bowls. After letting our bowls dry for a week, we’ll finish and decorate them during the second session. This is a wet outdoor activity, so please come prepared on the first day of the workshop to work on our shaded back patio. All tools and materials will be provided for your use in the class, and you’ll take home one or two paper pulp bowls (depending on time). 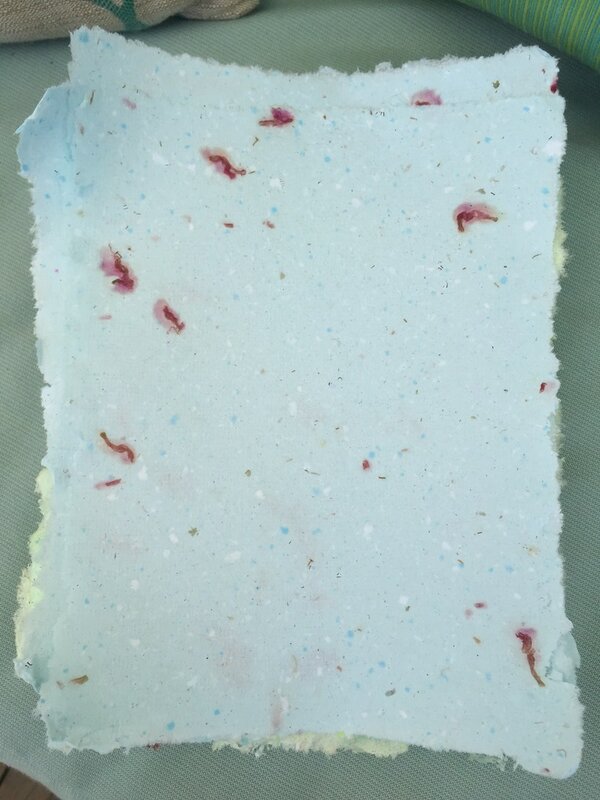 If you have any decorative paper that you wish to incorporate into your bowl, please bring it for the first session. Appropriate for all levels. 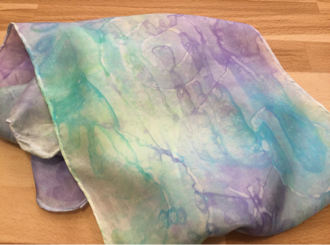 Batik is traditionally done using hot wax to create elaborate designs on fabric, but we will learn to create something similar using simple hot glue and dye on a lightweight silk scarf for you to take home. All tools and materials will be provided for your use in the workshop. All levels. Saturday, August 19 – 10 a.m. to 1 p.m.
Join us for our second summer of Creative Camps for Young People! This summer, we are offering four separate weeks—two for children ages 8 to 12 (one week for fiber arts, one for paper arts), and two for teenagers ages 13 to 17 (also one week for fiber arts, one for paper arts). Each week is independent of the other, so your child can take one or both. For more information on our Creative Camps, please visit our Creative Camps page. 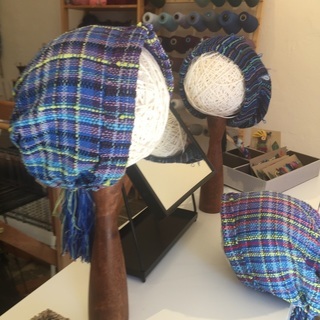 Weaving (several different small looms + floor loom), knitting without needles (finger, spool, and loom knitting), felting (wet felting, Nuno felting), Kool-Aid dyeing, fabric painting, stamp making. 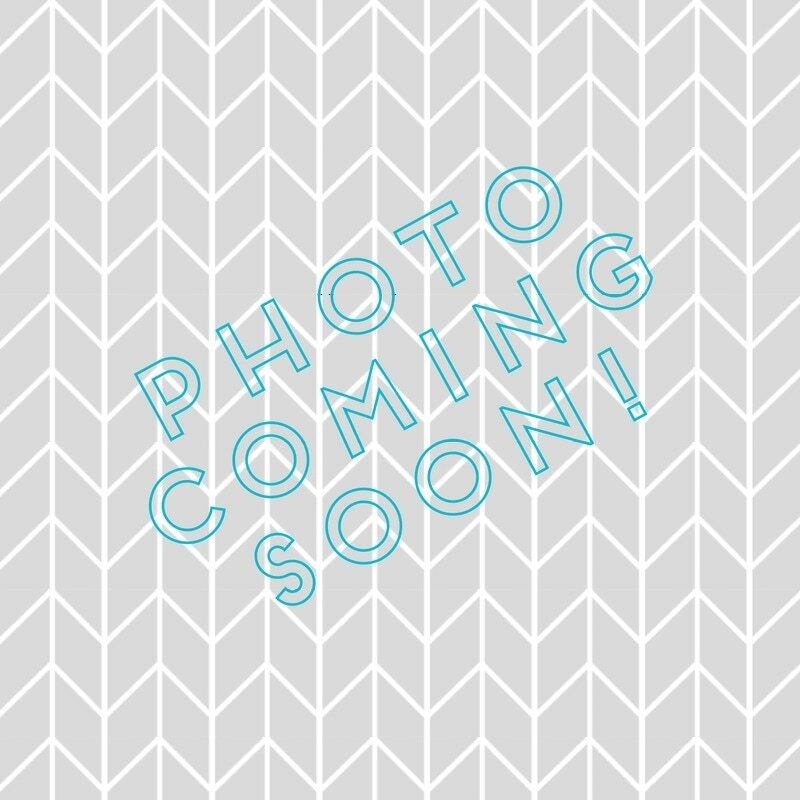 Also, watch for our new Kids' Class schedule--Coming Soon! We are proud to announce a fun new option for your creative workshop-taking pleasure: You + 2. See a workshop you’d like to take, but the timing doesn’t work for you? If you can find two (or more—up to 6 total!) friends who want to take it with you, we can arrange to teach any workshop in our Workshop Catalog at a time convenient for you. Check out our Workshop Catalog online (or stop by the studio to pick one up—we can even mail you a copy!) for a listing of our current offerings. Then contact us to set up a workshop time. It’s that simple. 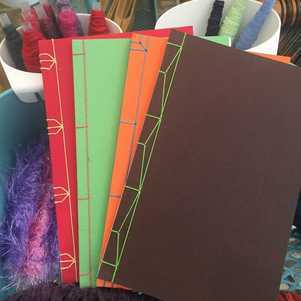 We are now offering a weekly Open Bookbinding Studio on Wednesday nights between 6 p.m. and 8 p.m. 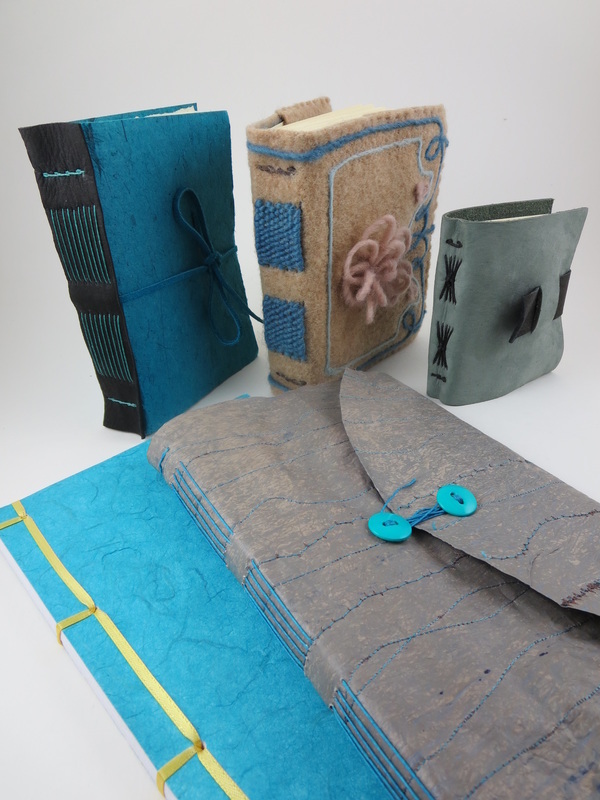 Here you will be able to use any of our bookbinding tools, and someone will be here to offer advice and assistance, as well. The cost will be $10 for up to the full two hours (come as little or as long as you want within that two-hour time period). We'll also have supply kits (cover material, paper, binding thread) available if you'd like to use those materials to make your book, or you can bring your own. There is no need to pre-register, but if you think you will come to Open Bookbinding Studio but will not be able to be there right at 6:00 p.m.,please call, text, or email me to let us know you are coming.